A free British Food Association report for download. See how MarketLine research can save you time. 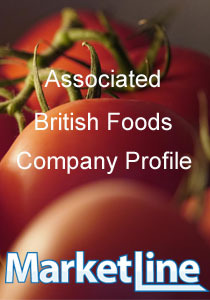 Associated British Foods is a diversified food, ingredients and retail group. The group operates in Europe, Africa, Australia, the Americas and Asia. It is headquartered in London, the UK and employed about 112,652 people, on an average, for the year ending September 2013. Download our company report today and get an overview of the key facts, employees, deal activity, and Mergers and Acquisition including SWOT Analysis.